Problem: Customer needed a mobile website. 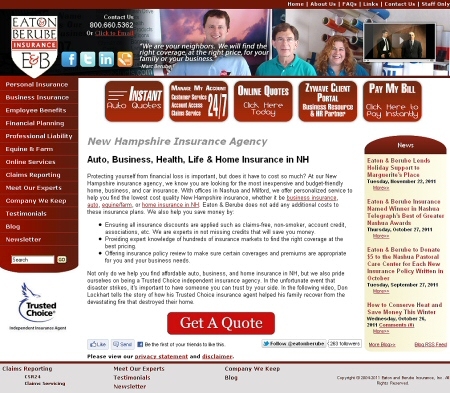 Solution: We custom designed Business New Hampshire Magazine's website to reformat itself to fit the dimensions of the display device being used and then created a new layout specifically designed for mobile phones. This way no matter what new tablets or phones come out in the future, the customer's website will automatically conform to the new dimensions saving them time and money. Solution: We used a new design technique to create the mobile site look, but gave them one place to make all of their changes instead of two. Now "Freedom" has even more value for their business. 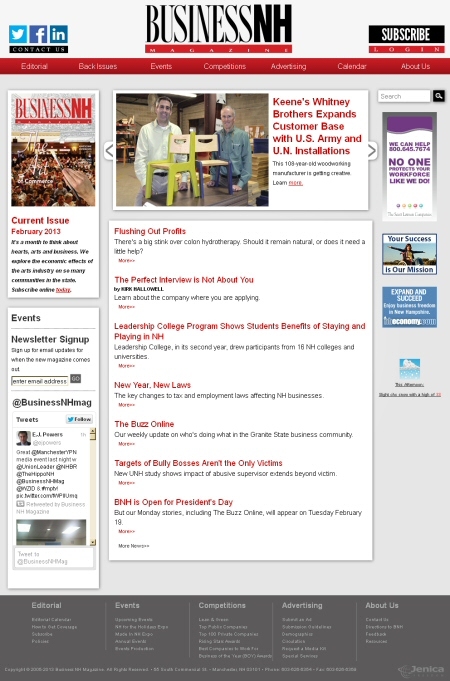 Solution: We designed their mobile site with a look that would attract their audience - STUDENTS! Since this demographic uses smartphones in scores, it was the best way to reach them. As soon as the mobile site was launched, their sales soared. As their future offerings expand, Freedom will be there with the right solutions to fit their needs for years to come...even after graduation! Problem: Business NH Magazine did not have the ability to sell events and subscriptions online, and no ability to sell back issues or manage the content of their site. Solution: We converted their existing design and added eCommerce so they could sell event tickets and subscriptions as well as back issues. They also can update all of their content to match their printed publication, keeping the site fresh and interesting to their readers. Problem: Had a very busy site, but very little functionality with no ability to keep their site up to date at the level they wanted. Solution: With new products being added regularly and new stores opening as well, The Paper Store wanted a modern look, links to all of their store locations, a map and hours listing, visual calendars to show upcoming in-store events, and the ability to promote their products and services online. Our Freedom solution accomplished all that and more. Their in-house marketing staff loves being able to upload the latest products, copies of print ads with a flair and the ability to send a large number of customers emails with information about the latest promotions. Problem: A local, full service insurance agency with a tired look and no formal plan for Internet marketing to develop new leads or promote their special areas of expertise such as, horses, farms and the farming business. Solution: Their site was given a clean, fresh look with a clear and crisp navigation scheme for ease of use. Each of their major product lines will now be represented by a corresponding micro site. Major SEO improvements are still being made to their home site as well as the new micro sites to give them more exposure on the web. 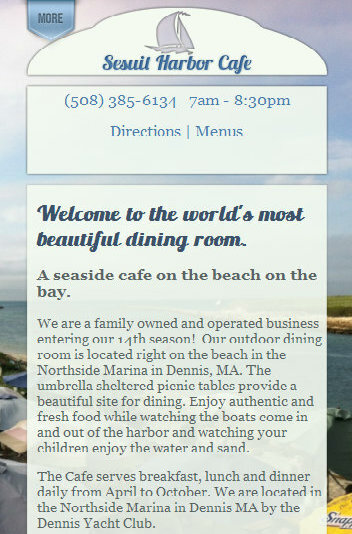 Have a meal and take a tour of the Sesuit harbor! 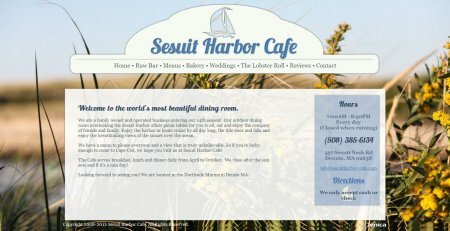 Solution: We created a responsive design using rotating images of Sesuit Harbor as the background and a custom photo album to showcase their catering functions. 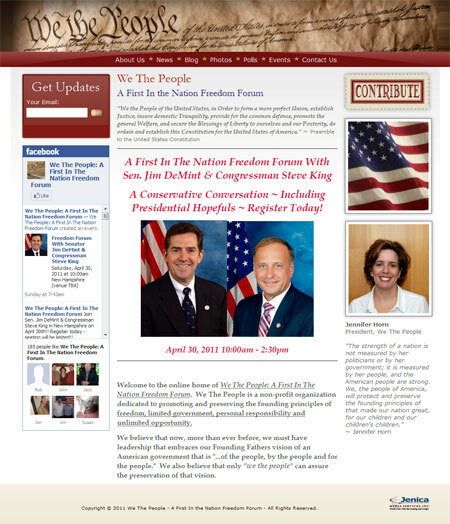 Solution: We created a website design reminescent of the Constitution with the Freedom Content Management system as the website's driving force. She can now blog, send out large email campaigns, and create events all from her website's control panel. 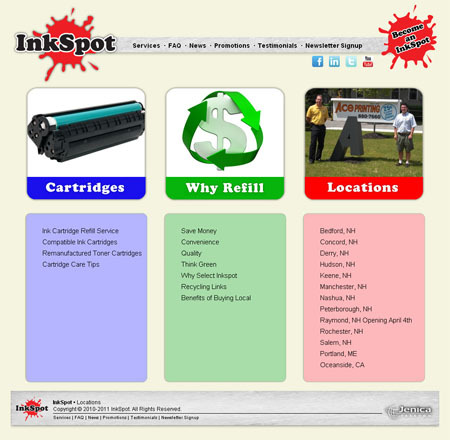 Problem: Ink Spot needed an updated look and feel to their website and the ability to announce new locations as they open. Solution: We created a design that reflected a printer cartridge company with an eco friendly stance. Now the customer can send out newsletters everytime he adds a new location using our Freedom content management system. 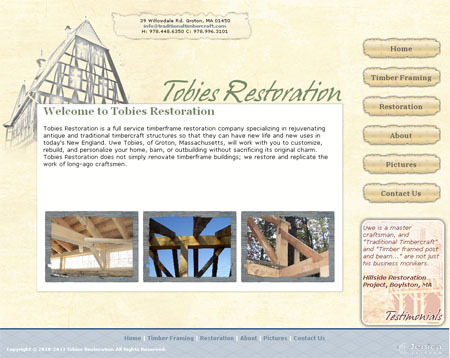 Solution: We created a web design that reflected the old world style of his framing business with a custom photo album that really showcases his beautiful work.